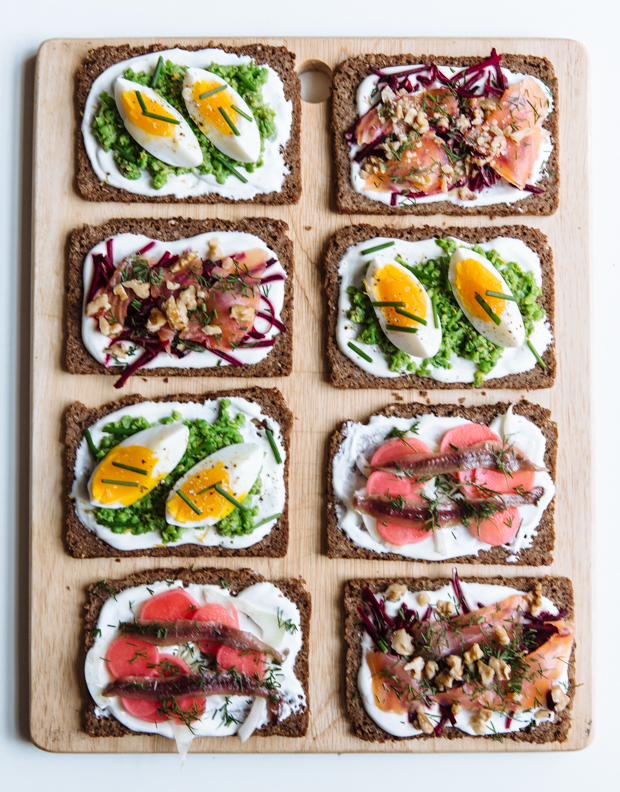 These Nordic open-faced sandwiches have been the most fun I’ve had in the kitchen lately. I love an large array of mise-en-place when preparing a dish- the OCD side of me feels perfectly at home- and if the little bits and bobs I need to plate are extra pretty (like the ones I used here), I’m always extra happy. 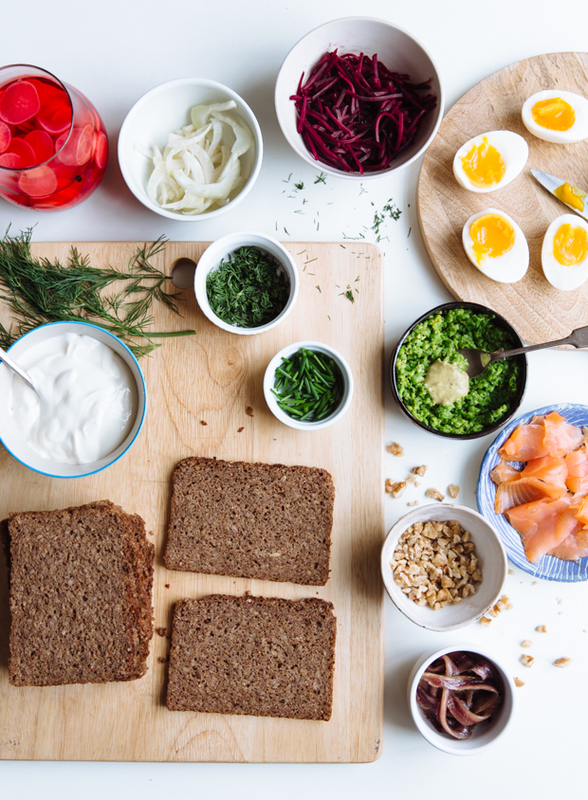 It all started with rye bread, which was the perfect canvas for these beauties. While I’m a sucker for making bread, I don’t do it as much as I’d like- probably because I can polish off a whole loaf on my own in about a day or so. Actually, no, that’s definitely the reason. 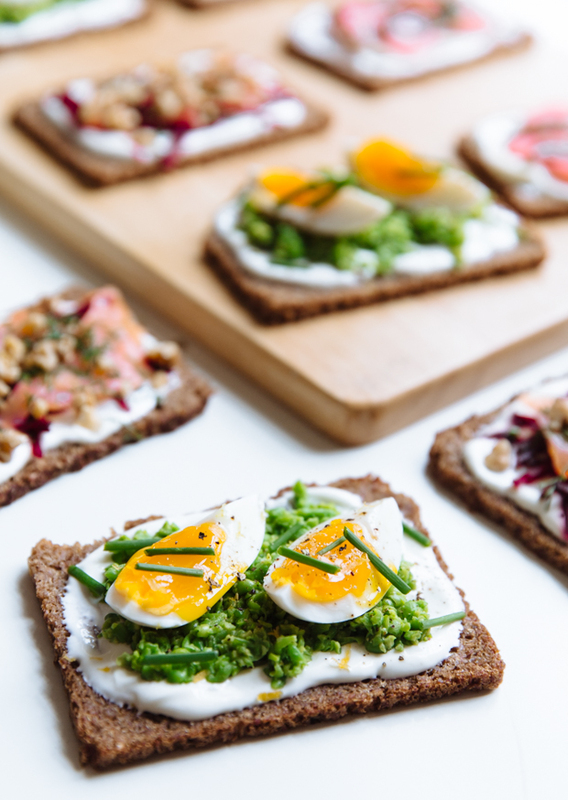 Lately however, I’ve been really liking a slice of rye along with my eggs, covered with avocado slices or just topped with some tahini and honey. Since I’ve fallen for it’s almost nutty flavour and crumbly, sticky texture, I’ve been wanting to do more with it. 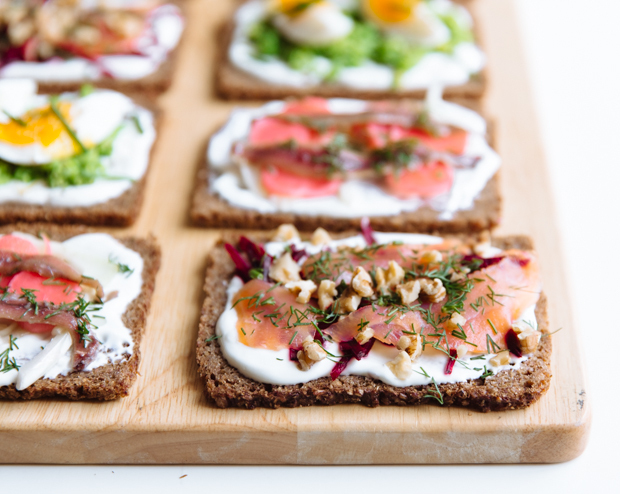 Inspired by Nordic cuisine, of which rye bread is a staple, I’ve come up with these open-faced sandwiches, combining other ingredients often featured in Nordic dishes. All are fresh, with beautiful colours, soft textures and interesting flavours, sweet, salty and briny, complementing each other and resulting in exciting and satisfying bites: smoked salmon paired with grated beet, dill and crunchy walnuts; 6-minute egg with mustardy, lemony peas and salty sardines with pickled radishes and crunchy fennel, all resting on a slice of rye covered in smooth crème fraîche and sprinkled with fresh herbs. First prepare the pickled radishes (preferably the night before, or at least two hours before serving the sandwiches): place the sliced radishes in a jar and set aside. Add all the remaining ingredients in a small pot over low heat. Cook until the sugar dissolves, stirring occasionally, about 7′. Remove from the heat, let sit for a few minutes and pour over the radishes. Let sit for 10′, seal and refrigerate until ready to use. Keep in the fridge for up to two weeks. For the 6′ eggs: bring a big pot of water to a boil. Lower the heat to medium and carefully add the eggs. Cook for 6′, take out with a slotted spoon and immediately place in a bowl of ice cold water. Allow to sit for a few minutes, remove and carefully peel. 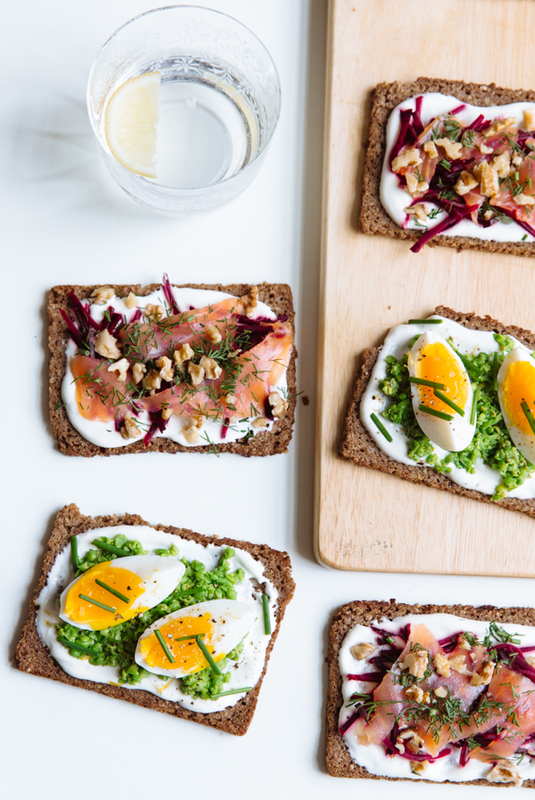 To assemble the sandwiches: spread a generous dollop of crème fraîche (about a tablespoon) on each slice of bread. 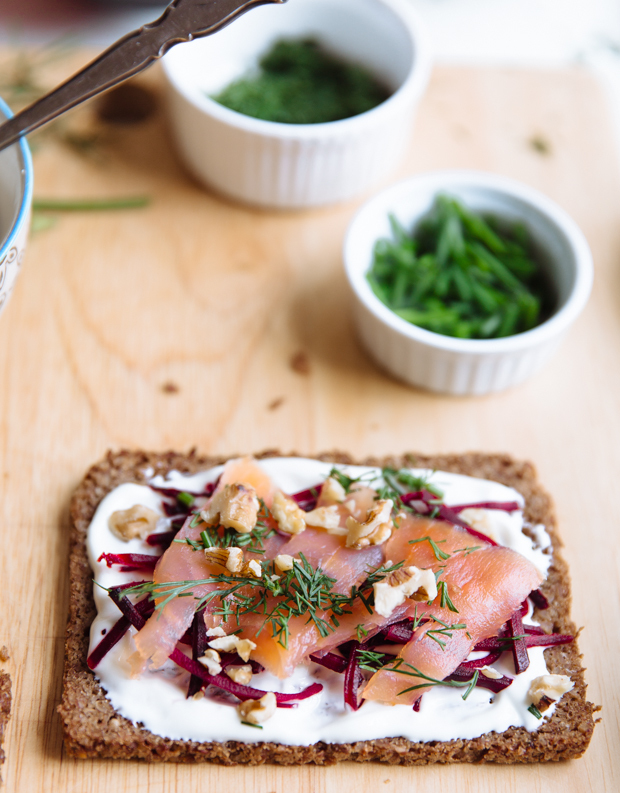 For the salmon one: top four slices of bread with the grated beet, one slice of smoked salmon, the chopped walnuts, a good sprinkle of dill and some fresh lemon juice. For the egg ones: slice each egg in four. Combine the cooked peas, mustard, lemon zest and sea salt. 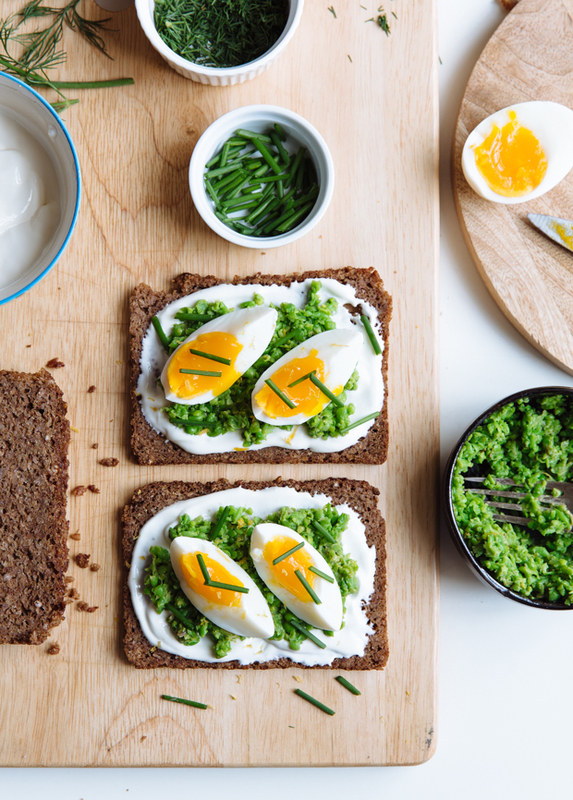 Top four slices with a heaping tablespoon of the pea & mustard mixture; add two egg slices, extra lemon zest and minced chives. 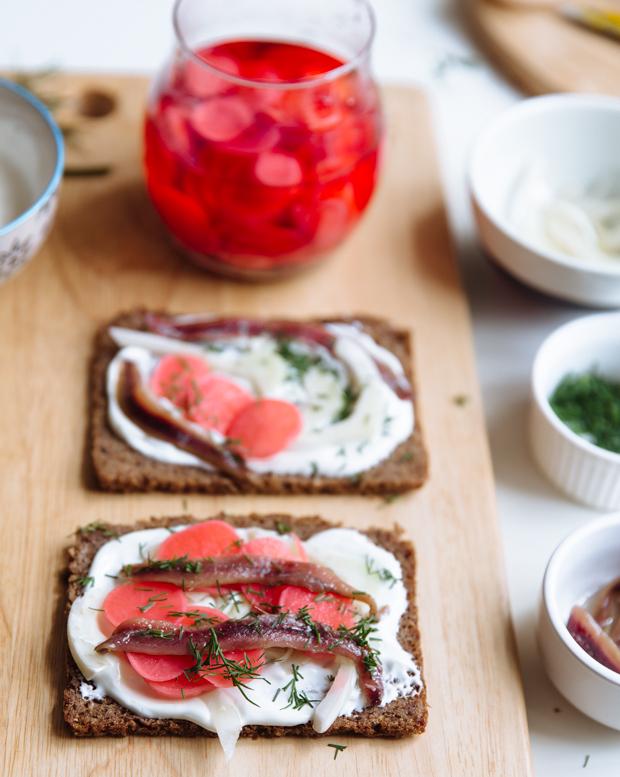 For the anchovy ones: top the remaining bread slices with a few pickled radishes and fennel slices, two anchovies for each and some fresh dill.